We arrived at Rough Trade East record shop in the late afternoon and what a wonderful place it is – a throwback to how record shops used to be, should be and can be – packed with a huge variety of stock, masses of vinyl and friendly knowledgeable staff. I had a quick chat with Patty’s sound man /engineer Roy Taylor. Roy engineered the American Kid album and was also directed and designed the striking video for Ohio. Roy told me that along with Patty and Robert he checked out the shop on Sunday ‘’Robert took us to a curry house around the corner he used to go to 15 years back and luckily it was still there’’ he laughed. A large queue had gathered outside by 7pm and Robert and Patty arrived just before that as the shop closed temporarily for the soundcheck. Whilst in the shop during the soundcheck, Robert brought Ian Sinclair’s Lights Out For The Territory, a book about London life and enthusiastically chatted to the sales person about it. He looked very relaxed and on great form. Quick aside: Bob Mould of Husker Du had been spotted outside the store by our TBL man Tony Crowley and came in to watch the performance. Patty took to the stage and apologised for the fact she was suffering from a cold. This did not deter her from applying herself fully to a seven song set that kicked off with Gonna Miss You When Your Gone from the American Kid album. Her telling of stories between songs added an air of informality to the performance as she explained how the passing of her father had inspired much of the writing of American Kid. 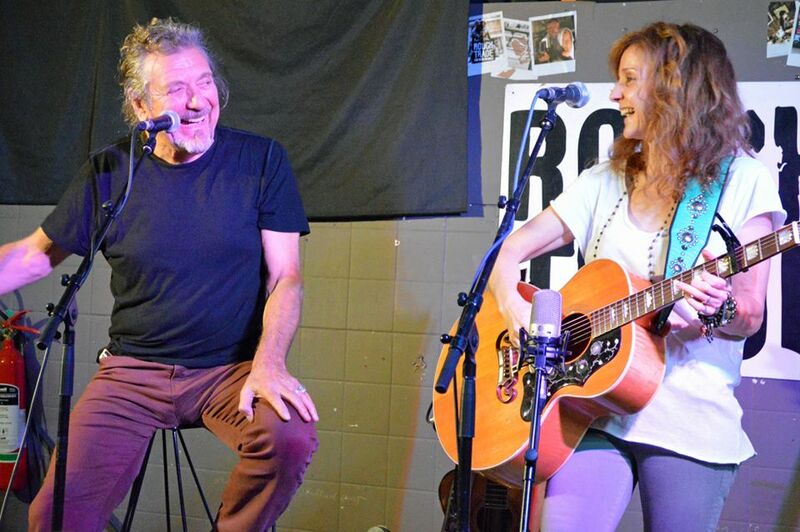 Robert was equally lucid when he joined her for Highway Song, which was preceded by a very a humorous story about how he and Patty had got stopped for speeding by the cops and when asked to hand over their papers had mistakenly handed over a prescription for painkillers. In such close proximity, it was an absolute joy to witness the vocal purity and closeness of the pair as they complimented each other’s vocal nuances and Robert added a touch of harmonica. Patty graciously thanked everyone for coming and commented how they had enjoyed being in the store on their visit last Sunday. An encore of Railroad Wings was an added bonus and a final example of the natural control and precision of her vocal ability. Afterwards Patty took to the counter to conduct a signing session happily posing for photos. 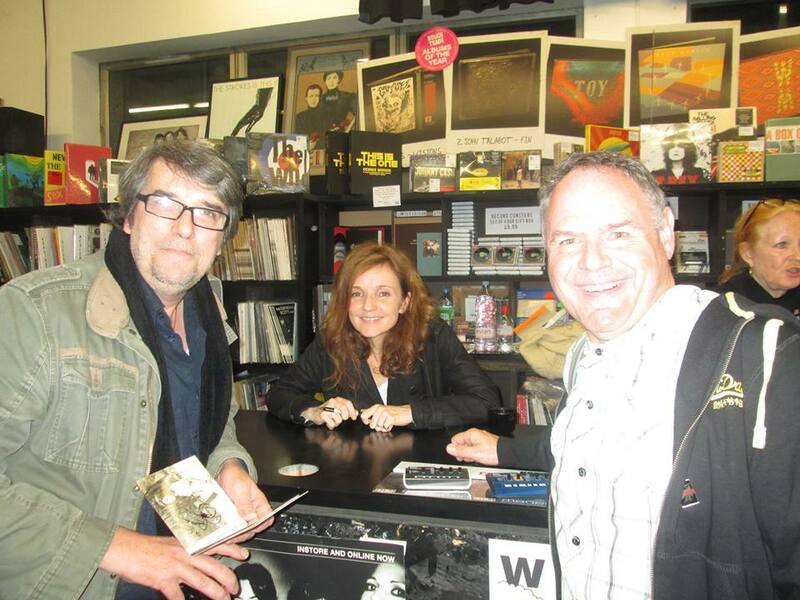 –A word here for Millie and the great Rough Trade staff who organised it all with minimum fuss. There’s more promotional duties ahead in Glasgow today and then Patty is back to the US to commence her tour dates – she is back here in July for a seven date tour that includes an appearance at London’s Union Chapel – as Patty put it ‘’I’ll be singing the song in the right key then’’. 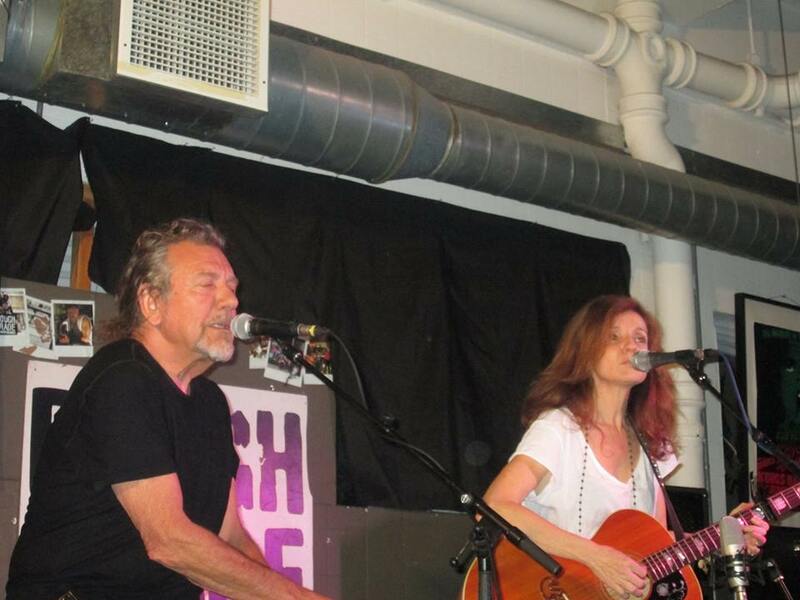 Lower key or not, Patty Griffin’s performance brought a stark concert style intimacy to the record shop surroundings of Rough Trade East. You would be well advised to catch Patty when she returns in the summer. As for Robert, as Krys Jantzen put it, he keeps on happily veering and careering, avoiding and inventing. All in all a delightful evening….it was a privilege to be in attendance. Dave Lewis – May 17th, 2013. A week of intensive work on TBL 35 here that was at short notice, interspersed by last night’s trip out to Rough Trade East. 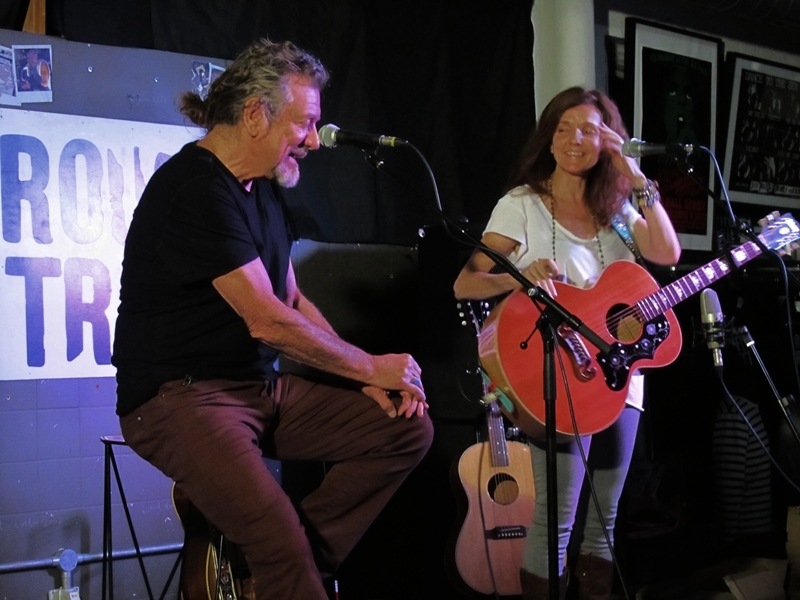 I’ve previously seen Robert Plant sing in a field outside Stevenage, in stadiums, in arenas, in pubs, in clubs, in a tent and now in a record shop. It was great to see a big turn of TBL crew – hello MK crew ,Cliff the ticket man, Simon C, Andreas, Krys J, Mick B and James, Paul S, Tony C and Julie, and of course Gary F – the first gathering for many months –and it was nice to meet James Cook and Trace Smith. And as ever it’s always great to be reunited with the Bedford Earls Court 4 of me Tom Phil and Dec – particularly on this 38th anniversary. Beforehand Tom and I made a quick stop off at Spitalfields Market were vinyl was inevitably purchased – Steve Miller Band Children of The Future , Lee Michaels 5th (he supported Zep at Kezar) and an Immediate label compilation with Jimmy Page on –hey a quid apiece!) –also saw a great Coda poster on one of the stalls. 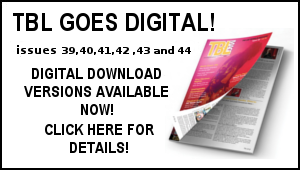 It’s back on to TBL 35 this morning with more work on the Aubrey Powell interview and a skype session tonight with Mike Tremaglio to oversee and proof the text. Hoping for a total wrap in the next couple of weeks – more on all this soon. On the player, Hipgnosis inspired albums –Bad Company Straight Shooter, Peter Frampton Something Happening, Pretty Things Silk Torpedo amongst them plus Patty’s American Kid and Robert Plant Fate Of Nations. Football wise Spurs will need to win against Sunderland and Arsenal to lose or draw at Newcastle to decide that Champions League place on Sunday. Here’s hoping. Right there’s a magazine to design –I need to search TBL designer Mick Lowe out and get sorted and back on it. May 17th a dull rainy Saturday. Left Bedford around 4pm on the train and met my Earls Court companion Fiona in London for the long awaited return of Led Zeppelin. I’d been counting the days down since March and now here we were hours from seeing and believing. We were inside the arena from around 7pm and the next hour was a slow one – I’d brought a programme and t.shirt. The programme with the illuminating text from Tony Palmer really whetted the appetite and had some amazing photos. We had a good view high up to the right looking down towards Jimmy’s side. They were a little nervous and it was evident Jimmy was having lead trouble in Rock And Roll, but once they settled in it was all and more I’d hoped for. The video screen high above the stage was something I’d never seen at a gig before and I found myself gazing in awe at the memorable images flashing on screen- and wishing it was going to be broadcast on TV. I’d played Physical Graffiti non stop since it had come out so seeing and hearing In My Time, Kashmir and Trampled played live was just awe inspiring. Tangerine was an unexpected treat as was the whole acoustic interlude. 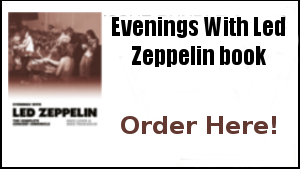 Having no idea what the set list would be only added to the pure wonderment of seeing Led Zeppelin live before my very eyes. Initial opening night impressions: Bonzo’s incredible drum sound, Robert’s warm rapport with the crowd and the way he totally dominated the stage. The marathon Dazed and the laser lights shooting through Jimmy’s violin bow. They were gods! 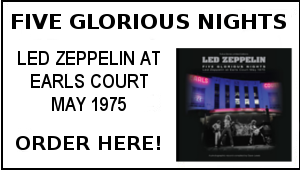 The Led Zep Earls Court experience was underway…and boy life was good…Dave Lewis – May 17th 2013. To be continued…. Woke up around 10am with the prospect of the second Zep gig ahead. In the morning I brought the Sunday Observer with the colour suppelment magazine that carried a major Tony Palmer feature –parts of which were in the official Earls Court programme. ”Led Zeppelin bigger than The Beatles?” proclaimed the front cover. What a compliment. On the train at 5 in the afternoon with fellow fan/Wallbanger player Nic and his girlfriend. My eldest brother Mervyn attended this night with his wife -he was most impressed but suffered what he describes as psychedelic nightmares for days after! Hung outside Earls Court amongst the programme sellers and poster stalls before the show -bought a bootleg badge which was as nearly as big as a dinner plate. Wore it with pride for years. Improved view tonight lower down -same (Jimmy’s) side. Three performances stood out -a chugging Over The Hills with that meandering Page solo, an intensive and incessant In My Time Of Dying (Robert’s pleading ”I believe I did somebody some good ‘’ line resounded in my ears all the way home) and a wonderfully relaxed No Quarter led by Jonesy’s virtuoso piano. That performance made me realize how important he was to it all. No major changes in the set list but that did not seem to matter. Each song was welcomed like an old friend by the appreciative audience. 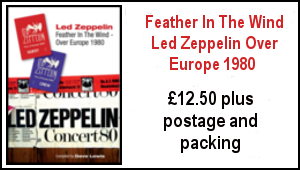 There was a real sense that Led Zeppelin were coming home as true champions. We just managed to get the last train back and in for 2.30am. I was off work behind the record counter at WH Smith on the Monday and it was a lovely sunny day. We sat by the river reading various national newspaper reviews and the Observer supplement again. That was the quote I memorized word for word to relay the lovely elderly ladies I worked with at WH Smith or anyone else for that matter!. The Sun newspaper also did a fantastic spread on them. Suddenly Led Zeppelin were being talked about outside of the rock media. Anyone know if Norman Hale put in an appearance on piano at all??? justin adams or juldeh camara but really like them now so much ive beento see them in concert and have bought there albums. i think everyone can agree on always a superb read. I was a fan of Patty’s before Band of Joy. I’ve seen her live twice, and she is a captivating singer. Some people like a variety of music, as Americana is my favorite genre of music. Well looks like Mr.Plant will be playing some shows this side of the Atlantic late summer/Autumn after all. Wonders never cease ! Jimmy – you need to get out there & match fit ahead of that 70th coming up next year ! Really? 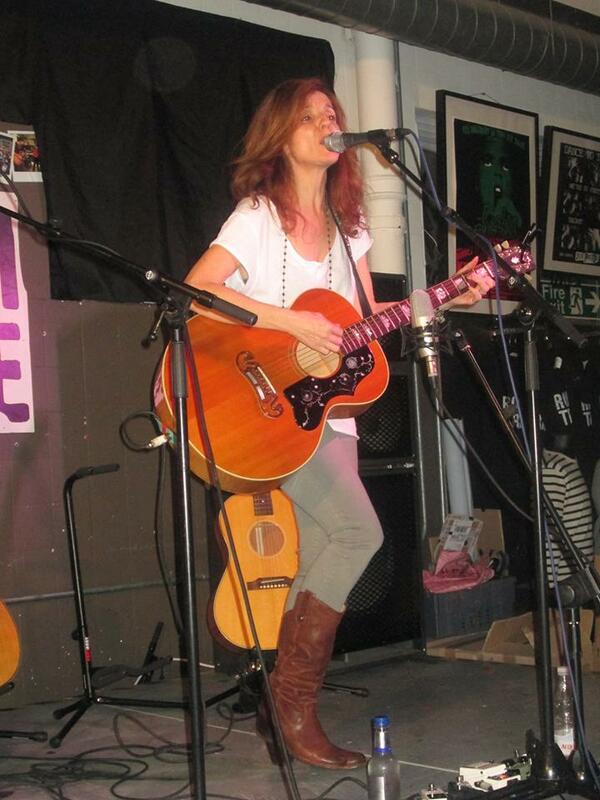 Patty Griffin had fans before Robert Plant?? Talk about presumption! Ryan, Thanks for saying what I was thinking. I believe members of the TBL staff are big fans of Patty’s from previous posts. She is wonderful, as is Robert! Following on from Ryan I have always found Robert to be a great sign poster into music and I have found (through him) music that I have come to love, genres and artists, that I wouldn’t have even listened to if it wasn’t for the slight nudge from the main man. I can readily recite examples such as the Cocteau Twins, Moby Grape, Fairport, Primal Scream, and if I’m honest the whole West Coast Scene, even Crosby Stills and Nash, and of course, Joni. Whenever he has covered a song I’ve sought the original, and then other covers, and it spirals. He is not only the Mighty Rearranger but also the Mighty Recommender! Patti of course is established in her own right and excellent in her own right .. but a bit of PR helps her too. Good on you Dave! 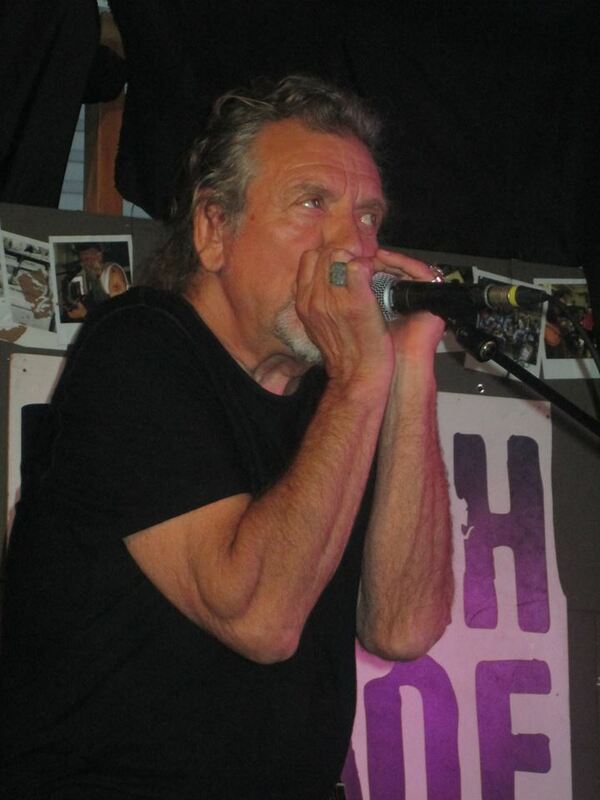 Believe it or not Alex, Patty did have fans prior to her work with Robert Plant, and made some along the way with it. Even if she wasn’t as well known by people before The Band of Joy, there is no reason to assume that people wouldn’t enjoy her music now that they do know about her. There’s nothing shameless in going to see someone play. Even the people who went to see Robert play with her, still could very easily get something out of the experience and it’s rather presumptuous to believe you know anyone’s intentions. I’m glad it was an enjoyable time. The pictures are very nice, as is the album. You would have no interest in her music if it weren’t for Robert Plant. You’re shameless. Thanks Dave , it was a wonderful night ! I thought the performance of Highway Song was better than the one they did on the Jools Holland programme this week. Also, I seem to have lost the Bowie vinyl I bought to Dan …that didn’t take long !